A new model for 2016, Regal’s 26 Express is the smallest of four Express models to 32-feet and follows on the heels of Regal’s successful introduction last year of the 28 Express, one of the largest trailerable express cruisers on the market. In all, Regal Marine of Orlando, Florida offers thirty-three models of bowriders, cuddy cabins, deck boats, express cruisers, and sport coupe’s from nineteen to fifty-three feet. Indeed at 26-feet LOA on an 8½-foot legally trailerable beam with an approximate dry weight of 6,200 pounds, the 26 Express is a relatively easy family cruiser to tow given the right tow vehicle. And with its comfortable four person overnighting capabilities and standard and available amenities, it is a family-friendly weekending or extended period live aboard cruiser. From Regal’s “low-to-the-water” integrated swim platform with starboard side underslung stainless steel boarding ladder, two molded-in port side steps lead up through a transom safety gate to the cockpit. Seating and storage fills the cockpit. The entire port side features bench seating, the forward portion of which is a forward-facing passenger seat with a hinged backrest. This backrest folds forward and down to a horizontal position filling the space to the passenger helm and thus forming a rear-facing lounge seat utilizing the padded and upholstered front face of the passenger helm as a backrest. A double-wide helm seat is back-to-back to an aft-facing double wide seat on the starboard cockpit side. Beneath this seat is dedicated storage for the standard 25-quart removable Igloo cooler. An available cockpit table serves this and the three person transom seat for five person face-to-face seating or entertaining. The backrest of this transom seat flips forward to serve as a backrest for the transom “Ultralounge” or flips right down horizontal to fill the space where the cockpit table would be and thus form one huge aft sunpad in combination with the aft-facing two-person seat. Regal’s premium polished stainless steel hand-wrapped tilting steering wheel fronts an anti-glare finished dash with Faria fog-resistant gauges at the helm of the 26 Express. 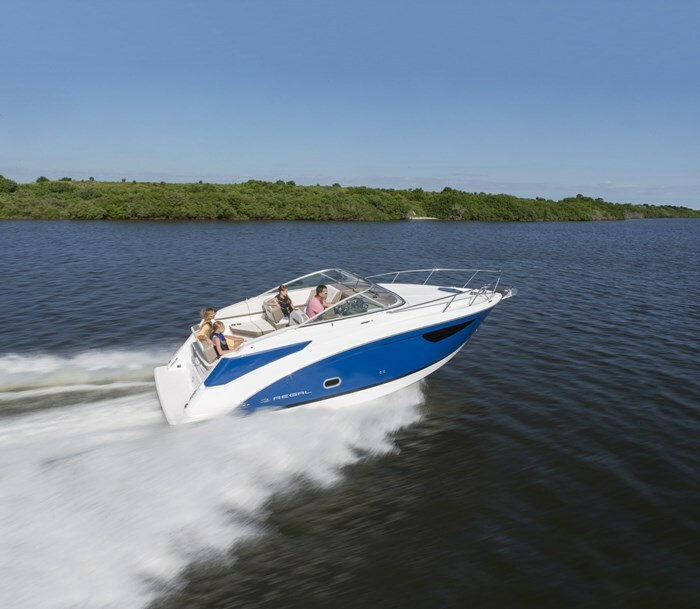 Standard equipment includes a 12-volt accessory receptacle, digital depth sounder with alarm, trim tabs, and a remote control for the cabin-mounted Fusion UD650 stereo with smartphone integration, Bluetooth® connectivity, plus two cabin and four cockpit 200 watt speakers. Other cockpit features include a trash container, blue LED courtesy lighting, transom shower, stainless steel drinkholders, and a polished stainless steel windshield header. Full-width, molded-in stairs within the sliding cabin door provide access up and through the opening windshield section to the foredeck. A flat forward portion of this foredeck facilitates anchoring along with the dedicated anchor locker and anchor roller. An open staircase with wood steps with non-slip inserts leads to the airy cabin below which, with the tall hull sides with relatively large hullside windows plus the overhead opening, screened deck hatch, all together provide ample headroom and natural lighting. A long U-shaped convertible dinette with its filler cushions doubling as dinette backrest cushions provides a comfortable two-person berth forward. To starboard is the galley with “hand-crafted walnut cabinetry,” single burner electric stove, sink, full-size microwave, plus a 4.2 cubic foot stainless refrigerator. Galley counter top colour options include Boardwalk, Hazelnut, or Moon Crystal. You may select Distinct Glacier Leather Touch or Moon Shadow for your cabin soft fabric choices. 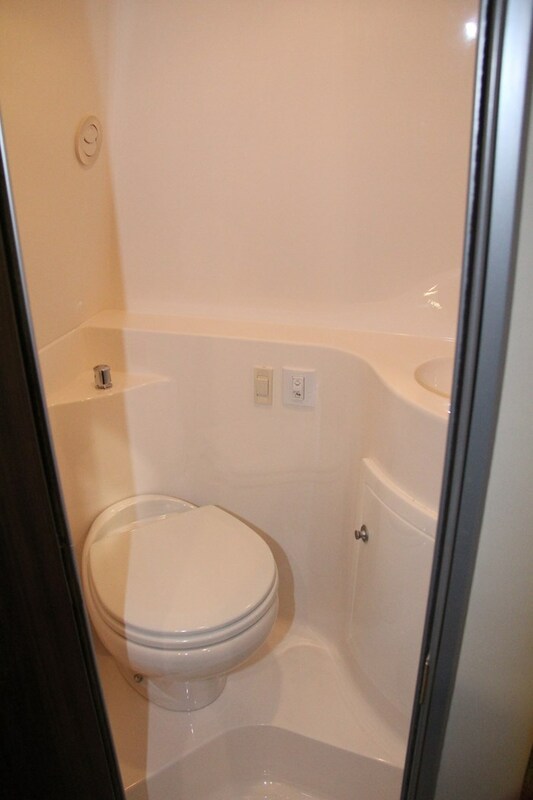 Opposite on the cabin port side is the molded fibreglass head compartment with vanity, sink, mirror, and pullout faucet/shower wand. The mid-cabin offers a long double size berth with reading lights, storage, and two opening, screened portlights. Standard hull colour is white with six optional choices of hull side colours. Notable optional equipment includes dockside power with battery charger, automatic fire extinguishing system, anchor windlass, remote spotlight, Garmin 7607 chartplotter, hot water heater, electric head, bow thruster, air conditioning/heating, foredeck sunpad, cockpit cover and/or full camper back enclosure, cockpit carpet or Seagrass, SeaDeck swim platform overlay, transom trim switch, gas grill, windshield wiper, and a flatscreen TV/DVD in the cabin. An electric Power Tower in black or white is also available. Choose from single Volvo or MerCruiser stern drive power with Duo-Prop (DP) or Bravo III (B3) outdrives respectively from 270 to 300 horsepower. The Regal 26 Express - virtually full-size cruiser amenities in a compact package.